More Secrets From Frank Sidebottom's Cartoons Unearthed By GCHQ? Home » Comics » More Secrets From Frank Sidebottom’s Cartoons Unearthed By GCHQ? 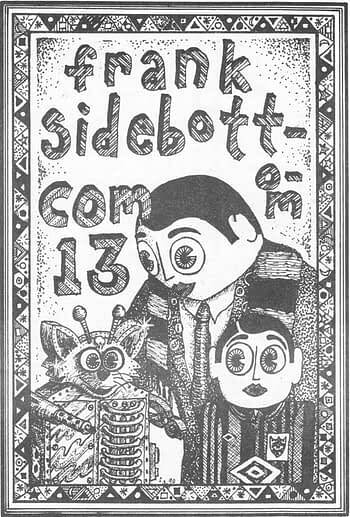 Man, I loved Frank Sidebottom. A stage character created, and lived, by computer games programmer, cartoonist and musician Chris Sievey in the eighties, and a popular media figure and music performer in the North West of England, he gained most prominence on British television in the nineties alongside a boom in surrealist comedy with Vic Reeves, Eddie Izzard and Harry Hill. 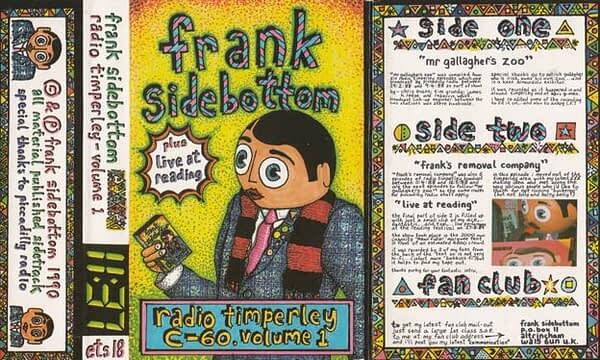 Frank Sidebottom’s star faded but he remained much loved, especially closer to home. When he died, there was a mass appeal to avoid him getting a pauper’s funeral and a brass statue was commissioned and erected in the town of Timperley that he made semi-famous. A nasally high pitched character, he distinctively wore a large paper mache head which was never removed, his songs and television shows exhibiting the peculiarly British comedy trope of having dreams and ambitions that are never achieved but without ever stemming that desire, reality never getting in the way. Indeed characters he created with other performers for his stage show and TV shows would get far more mainstream success, Caroline Aherne’s Mrs Merton, originally meant to be Frank’s neighbour shot her to success, alongside The Fast Show, to create The Royle Family before her own untimely death. His driver, Chris Evans, would become the hugely successful British DJ and TV presenter. His keyboard player, Jon Ronson, would become the author and documentary maker, and write the movie Frank starring Michael Fassbender as a Sidebottom-alike character – and his son Joel Ronson would write for Bleeding Cool. And, to accompany the release of the DVD of the documentary about him, Being Frank, directed by Steve Sullivan, the British secret services at GCHQ have announced they have translated the coded symbols that would appear on the cassette or CD linings of his records alongside his cartoons. Done at the request of fans and family as a translation exercise – and it helped that GCHQ has a number of big Sidebottom fans amongst their members – they have revealed a number of translated phrases. 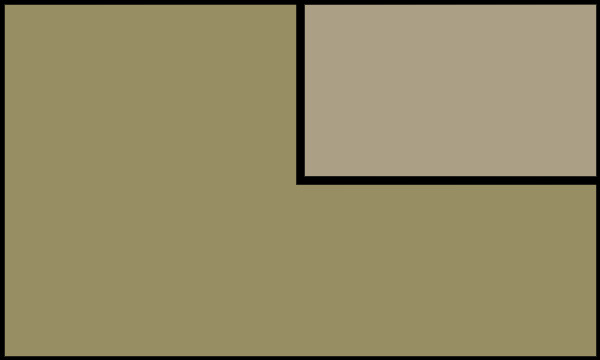 Such as the border on the left of this inlay reading “Why does my nose hurt after concerts?” – a reference to the peg Chris would wear on his nose to help create Frank Sidebottom’s distinctive voice. The BBC reported that Sullivan said he has “absolutely no idea” what that means. Except that GCHQ probably might. I turn now to Bleeding Cool’s Mark Seifert, who loves a good publishing mystery and tells us the following. I’m gonna presume that GCHQ fibbed to Sullivan if they really did tell him that it was all silly personal stuff. Because what good is an exercise in decoding the signals if you’re not going to develop the intelligence that you got from those signals as well? Presuming they did develop the data after figuring it out… well, I don’t know wtf it is, but it’s interesting. The “Man from Fish” thing is a reference from an obscure science fiction story by a little-known author. “As soon as the Security Officer’s report was received, the A.E.C. sent a battery of psychiatrists to the plant. After the psychiatrists reported, they, in turn, were sent to another battery of psychiatrists. After that, the A.E.C. called a top-level conference of the Defense Dept., F.B.I. (Dept. Just. ), Fish & Wildlife (Dept. Int. ), Public Health (Dept. Welf. ), Immigration & Naturalization and Alaskan Affairs. The latter turned out to be a mistake. This had taken two weeks, and George had lingered in the walls, impatiently waiting for his chance to testify. Of course, he was in telepathic communication with Clara. He knew that his family were all well, that Clara had made friends with the janitor, also that the trap was still there. So “Man from Fish” means an agent of the Department of the Interior — Intelligence Division, I would imagine. There are certainly “Top Secret” references throughout the story. And I think the inclusion of the Atomic Energy Commission references may be the final tell here — “EP” might be the Energy Program in Atomic Energy Program. A look at other stories in the 1954 issue of Galaxy that this includes the short story in question is also revelatory. Sturgeon’s cover story “Granny Won’t Knit” is likely focused around an analog to USAF Project SAGE. Keep in mind that during this era, USAF frequently engaged in what I’ll term “marketing” of various types, including in science fiction pulps, comic strips, and so on. Sturgeon seems to have confirmed the notion that this story could be “marketing” with an anecdote in a later collection that includes the story, by saying that it came about when his editor called him up to press for a late story, and when it wasn’t ready due to a bout of writer’s block, the editor put an unknown party on the phone whom he claimed was a writer who had an idea that he himself didn’t want to run with. And notably, AEC-USAF atmospheric tests were also being conducted to study the effects of radiation on soldiers who had been exposed to it in the field. This is all a pretty good fit, and what’s more it addresses similar types of concerns that would also likely influence Marvel Comics just a bit later. That radiation is of concern, but both here and in Marvel, there’s the suggestion that it can also give you powers like telepathy. And the intimidating, aggressive general with a reputation for solving problems by bombing them is also very likely inspired by larger-than-life SAC Commander General Curtis LeMay, who of course is also the model for Marvel’s General Ross. If you’re not familiar with General LeMay, rent the film Thirteen Days and you’ll see the point. Which also brings us to the title of this story, Chain of Command, a likely reference to the fact that shortly before it was published, President Eisenhower brought about the implementation of DoD Directive 5100.1, which was designed to more clearly emphasize civilian control over the military by clarifying the Secretary of Defense’s command over the DoD. More could be said, but you get the picture. But here’s the punchline: longtime Chris Sievey associate Jon Ronson is best known as the author of Men Who Stare at Goats, which is a comedy about a top secret USAF project. A neat little stack of data which contains a theme. Probably trivial, but I’d have my doubts GCHQ broke the code and then left it at that. And it wouldn’t surprise me if Jon Ronson had it all figured out a long time ago. Being Frank is released on DVD at the end of the month, with accompanying artwork for fans to decode, and the key for doing so, amongst the extras.